Following an incredible three-day adventure, the Incom-CNS team have brought home the prestigious first-place trophy after competing against 30 teams in the 2018 Gamma Ball Rally, organised to raise funds for UK based charities Action Through Enterprise and SpecialEffect. Adopting a ‘Monsters-Incom’ theme, this year’s scare-tastic crew – Sulley (CEO, David Hughes), Mike (CTO, Jason Kilvert), Roz (CFO, Ian Hargreaves) and Boo (Gamma BDM, Nikki Freeman) started the rally in a monster themed car worth no more than £500 at the iconic Brands Hatch Racing circuit in Kent, where they started the fun by taking part in the famous ‘best-dressed’ competition. Journeying through France with overnight stops in Reims, Lyon and finishing in Marseilles, the Monsters-Incom team completed various fun challenges, competing for points towards the overall top prize; including a treasure hunt dressed as a group of honey monsters and beach club games dressed in head-to-toe monster themed lycra! 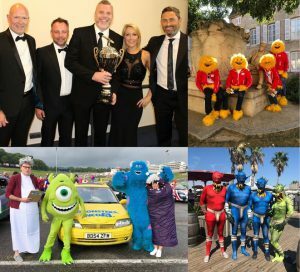 The fundraising rally finished in Marseilles with a glittering prize-giving ceremony, gala dinner and a charity auction hosted by comedian Dominic Holland. Organised by Gamma, this year’s rally aimed to raise a total of £100,000 for SpecialEffect and Action Through Enterprise, taking the total since the rally began to half a million pounds to date in the history of the rally. SpecialEffect uses video games and technology to enhance the quality of life of people with disabilities. Action Through Enterprise helps to fight poverty in Ghana, providing free school meals, encouraging business development and supporting families of children with special needs.